Established in 2009, Calgary First Aid offers the most number of workplace approved standard first aid, CPR and AED courses in Calgary. The company is known for its experienced teachers/instructors, clean classrooms and welcoming atmosphere. If you are looking for a reliable and world-class first-aid training provider, Calgary First Aid is the best choice for you. Interested course participants may register online, through the phone or via email. To register for a standard first aid and / or any other course in Calgary use the on-line registration form below. On-line registration is available below. You may also use the Contact Us page for any questions. To register for a course, you have several options to choose from. You can visit the link posted above to be re-directed to the Calgary First Aid website (www.firstaidcalgary.ca) or you may use the on-line registration form below and we will assist you in registration. Conveniently located just outside downtown Calgary in the SW quadrant, the location of Calgary First Aid is truly accessible for everyone. Public transit options include bus and the newly opened C-train station which is directly across the street. Free parking is also available nearby. 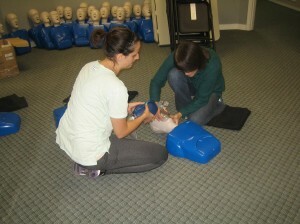 We partnered with Calgary First Aid to offer the most professional training classes in the area. The company is known as one of the best when it comes to CPR and standard first aid courses. Calgary First Aid offers low-priced trainings and excellent customer service. Courses are available all throughout the week in different training locations. With Calgary First Aid, you will be able to train under the most qualified teachers and instructors. They offer candidates the option of selecting the CPR level of their choice. Participants can choose CPR “A”, “C” or “HCP” for their standard first aid course. All CPR courses follow the newest and highest standards in CPR training. Courses vary in length depending on the level. 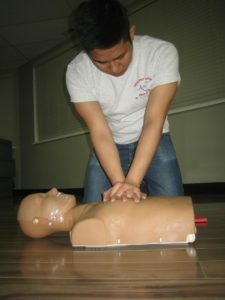 The courses offered by Calgary First Aid are very affordable. In addition to this, the quality of training they provide is undeniable. Their goal is to provide affordable, accessible and high-quality courses. Once the candidates complete the course, they will receive a workplace approved first aid and/or CPR certificate that is valid for 3 years. This certificate can be used anywhere in Canada because it meets the government’s standards. Participants of Calgary First Aid courses are assured that there will be no hidden fees and that they will train in clean and comfortable classrooms. Standard first aid course fees are clearly posted. You can expect that there are no additional fees presented later on. Training locations are conveniently located throughout the area offering standard first aid trainings on different dates and times. Course registration can be completed through a variety of different methods. Candidates can register online which is quick and easy. You can also register through the phone or via email. In case you have any queries and clarifications, you may contact Calgary First Aid’s office. Someone will always be willing to assist you during business hours. Aside from the CPR training and standard first-aid courses, Calgary First Aid also provides re-certification and other private courses. Private courses are available for individuals, groups or companies at various rates. You may contact Calgary First Aid at [email protected] for more information. Standard first aid renewal courses are available at least once a week in all training centres. All re-certification courses include CPR and automated external defibrillator (AED) certification. If you want a high quality training center, Calgary First Aid is the best training provider for you. They have experienced teachers/instructors who know what they are doing. In addition to this, they have the best training equipments which you will be able to try and practice on. Customers who register for standard first aid courses with Calgary First Aid can be assured of low prices without sacrificing the quality of the training. A first aid training is very important especially for those in the medical field. Your standard first aid award can be used to substitute an emergency first aid certificate. If you are not sure which workplace approved first aid or CPR award you need, we recommend that you take standard first aid. This is the highest level of certification available in for basic first aid. Calgary First Aid proudly offers this program as often as emergency first aid.